From innovative hull design and construction to cutting-edge technology for owners, Hatteras Yachts has led the sportfish and motor yacht industry in customer experience. United Yacht Sales has the experience and professional team to help guide you through the purchase of a new Hatteras Yacht. Almost 60 years ago, Hatteras Yachts founder Willis Slane set out to build a more durable sportfishing boat that could tame the waters off of Cape Hatteras, North Carolina. What he didn’t know at the time is that his idea would spark a legendary yacht brand that would become synonymous with the world of offshore sportfishing, particularly among die-hard Billfish tournament captains. The waters off of Cape Hatteras are influenced by the Gulf Stream and while this does bring with it a variety of popular gamefish like Marlin, Sailfish, Wahoo, and Tuna, it also can turn into a rough ride when wind and waves pick up. Slane’s first 40-foot fiberglass yacht, the Knit Wits, revolutionized the industry as we know it today with its strength and remarkable attention to detail. 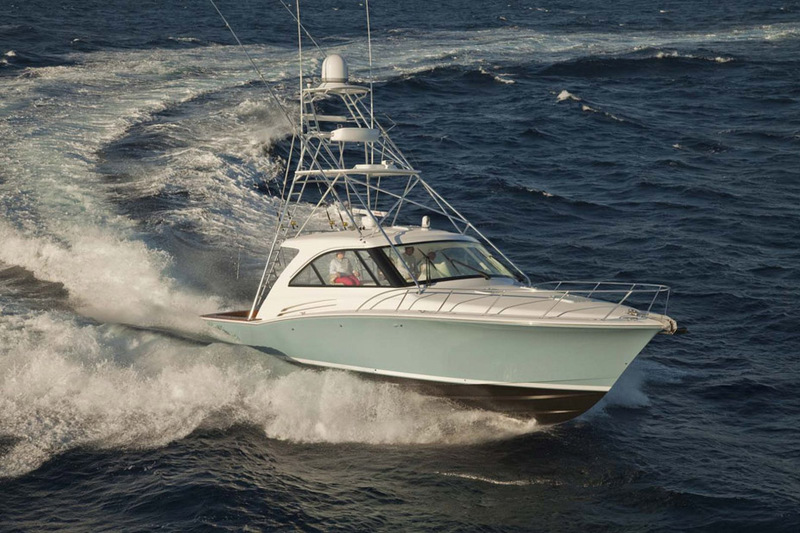 Hatteras Yachts are known for over-engineering every detail on their yachts, taking a que from the brand’s originator Willis Slane, which has resulted in a line of sportfishing yachts and luxury motor yachts, known for their innovation and quality craftsmanship. It’s that innovation that has kept Hatteras building boats every day through the highs and lows of the economy, which gives our yacht owners the peace of mind that the team at Hatteras will continue to support them with warranty, service, re-sale value, and exciting new product to further their boating experience beyond all expectations. From hull design to propulsion choices to interactive on-board connectivity, this commitment to innovation is what secures the lasting legacy of Hatteras Yachts. 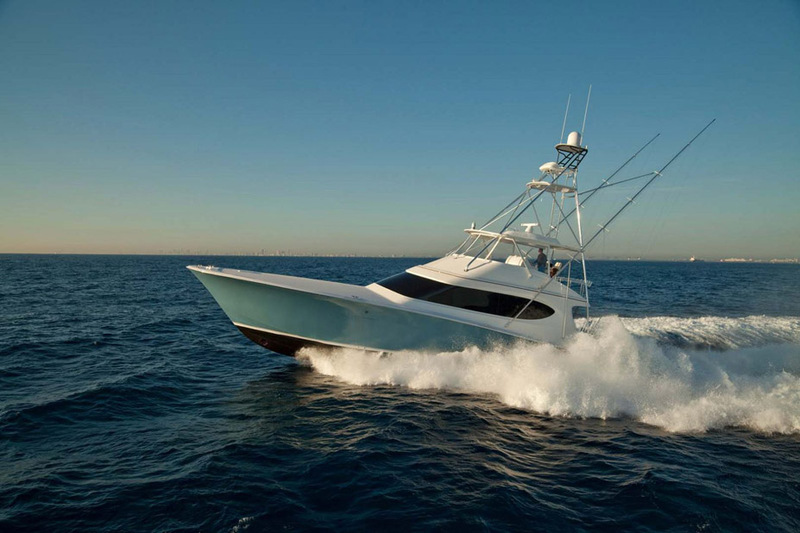 Brunswick sold Hatteras Yachts in 2013 to Versa Capital Management, LLC, an investment firm with a large portfolio of companies that includes Black Angus Steakhouses, Silver Airways, Polartec, and a variety of other companies in multiple industries. 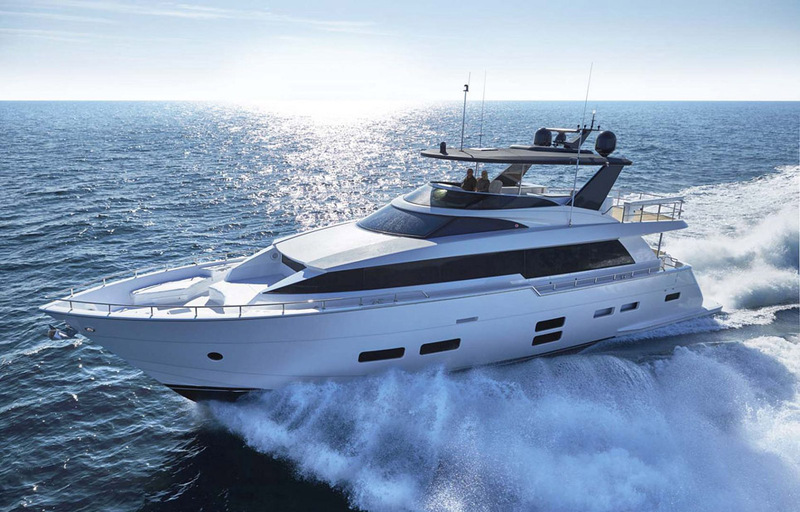 As part of this sale, Versa also retained the rights to Cabo Yachts as well. Today, both brands are thriving as Hatteras continues to debut new models like the GT59 and the GT65 Carolina, which are back on the tournament circuit and winning awards. 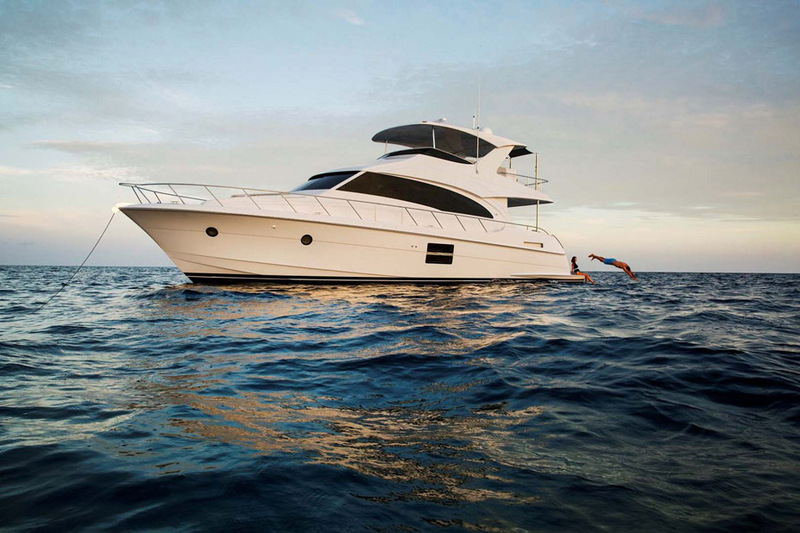 The Hatteras factory also debuted the new Cabo 41 Express at recent boat shows. Where Are Hatteras Boats And Yachts Made? The Hatteras factory is located in New Bern, North Carolina at 110 N Glenburie Road, which is located in between Wilmington, NC and Virginia Beach, VA. The factory sits on the Neuse River which is only a few minutes drive by boat to the Atlantic Ocean. The environment in the Atlantic Ocean can be rough at times which influenced the Hatteras "Carolina-Flare" hull design as well as the need to use a solid fiberglass resin-infused hull for extra strength and stiffness. Today, the Hatteras factory is thriving and employs hundreds of craftsmen and workers, contributing to the local economy. Whether you are charging 4-foot seas to the canyons or comfortably cruising the coast to Florida for the winter, it’s the behind-the-scenes details that make a Hatteras special. The patented air induction system reduces noise and vibration by over 200% while the resin-infusion process during the construction process provides for stronger and lighter decks, bulkheads, and other parts of the yacht. Even the in-house designed multi-bladed hybrid propellers offer advantages including improved fuel economy and a quieter ride. These details can only truly be appreciated by a trip to the Hatteras factory in New Bern, North Carolina. United Yacht Sales – New Jersey Division – is proud to be the exclusive dealer for Hatteras Sportfish and Motor Yachts in the Cape May area. Not only can our expert staff guide you through the new boat build and purchase process, but our industry-leading brokerage team can help with the re-sale of your used Hatteras Yacht. Scott White is the Hatteras and Cabo brand manager for United and recently sold hull #3 of the new GT59. If you're considering purchasing a new Hatteras or Cabo, give Scott a call today at (609) 780-0309. We have plenty of resources to help you through the process of buying a new Hatteras Yacht. Who is the CEO of Hatteras Yachts? In January 2017, Kelly Grindle took over as Chief Executive Officer of Hatteras Yachts and Cabo Yachts. Grindle's experience prior to Hatteras includes President of Outdoor Products at Vista Outdoor in Overland Park, Kansas. Vista Outdoor is a $2.3 billion designer, manufacturer, and marketer of consumer products in the outdoor sports and recreation market. Grindle received a degree in Finance from Indiana University - Kelley School of Business. Chairman of Hatteras and the CEO of Versa Capital Management had this to say about Kelly Grindle coming to Hatteras, "We are pleased to have recruited a senior executive with the industry knowledge and experience to lead Hatteras Yachts through its next phase of growth. Kelly Grindle is an acknowledged leader in the outdoor sports and recreational marine industries, and will have a positive impact on our ability to deliver the best quality yachts to Hatteras customers today, and to continue the company's long tradition of pioneering innovative design and technology in the future." Hatteras recently launched the new M90 Panacera in 2017 to rave reviews from brand enthusiasts, magazine editors, and other motor yacht owners. Hatteras CEO Kelley Grindle gushed over the “outstanding panoramic views as well as the ease of flow between social spaces.” If the new M90 was built for anything, it was for entertaining family or friends comfortably at sea. The main deck floorplan is completely unobstructed with lots of natural light giving you an openness that is unmatched in its class. The Flybridge is wide-open and allows plenty of room for sunbathing, grilling, and enjoying your company. The 22-foot 6-inch beam creates a broad sense of space and open areas, particularly in the salon and master stateroom which is full beam that has a king-size berth. The M90 has three other staterooms, each with en suite heads, along with crew quarters access via the transom that also has separate crew heads and galley. While the Hatteras M60 may be the smallest of the motor yacht series, the Hatteras team has done an exceptional job utilizing the 18' 2" beam and the space it creates. Small enough to be operated without a captain and crew, the M60 is a great option for the experienced motor yacht owner who wants an interior known to be one of the largest in its class. The full beam master suite is comfortable and features enough storage and hanging closet space for the M60 to be a true long distance cruising yacht should the opportunity arise. From the aft cockpit seating area to the country-style kitchen, the Hatteras M60 is a perfect yacht for entertaining no matter what the season. 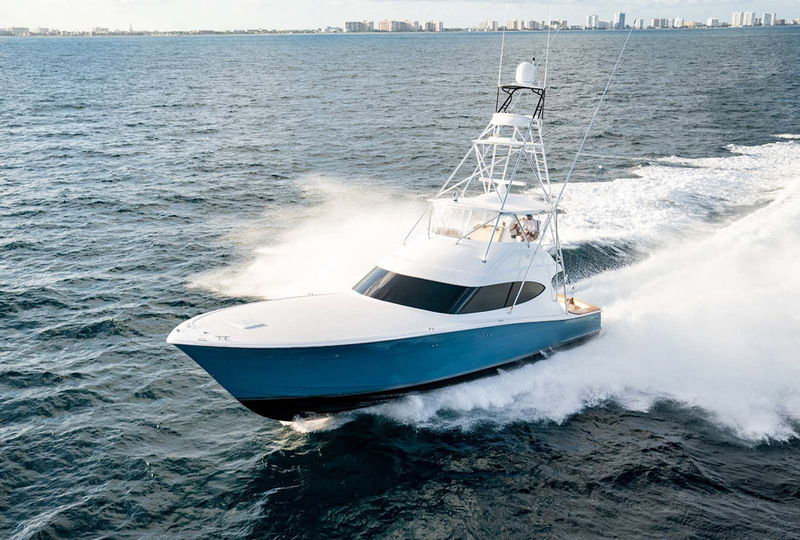 With the Hatteras Yachts brand being synonymous with durable, tournament-tested sportfishing yachts, it’s no surprise that the builder’s flagship boat is a 70-foot convertible. The 68GT, the previous flagship model, was built and delivered 51 times before the new GT70 was born. Everything about this vessel screams multi-day fishing excursion to the Canyons. 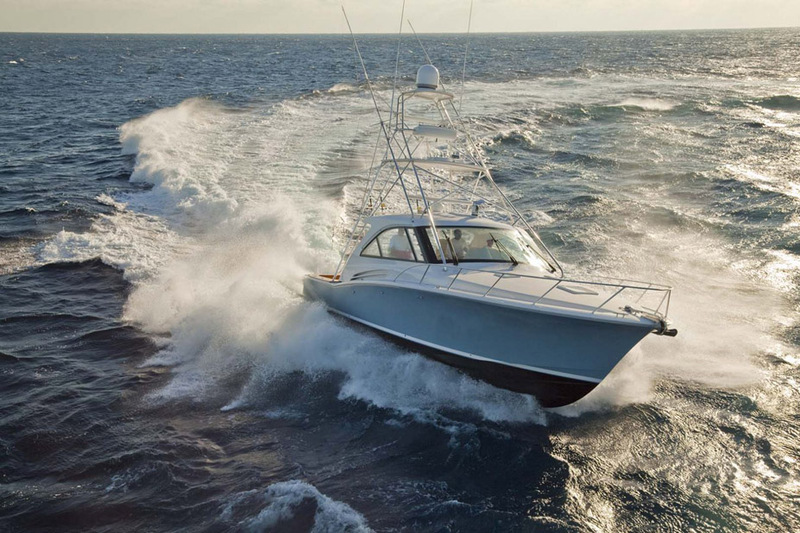 From the oversized fighting cockpit to the larger engines with added fuel capacity of 2,140 gallons to the 5-stateroom layout, the GT70 has everything you need in a convertible sportfish to hunt big game. 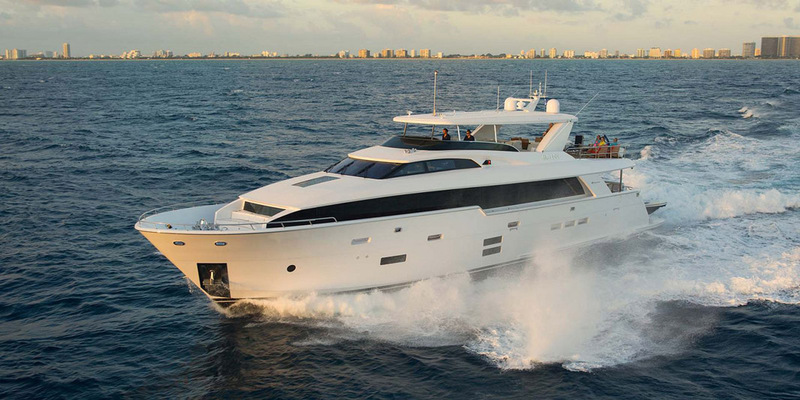 Despite her big 21-foot 4-inch beam, the Hatteras GT70 can easily break the 40-knot barrier when powered with the twin MTU 2600-HP diesel engines. And with a gourmet galley and spacious salon, your guests on board that aren’t strapped into the fighting chair or behind the helm can relax inside without being tossed around. 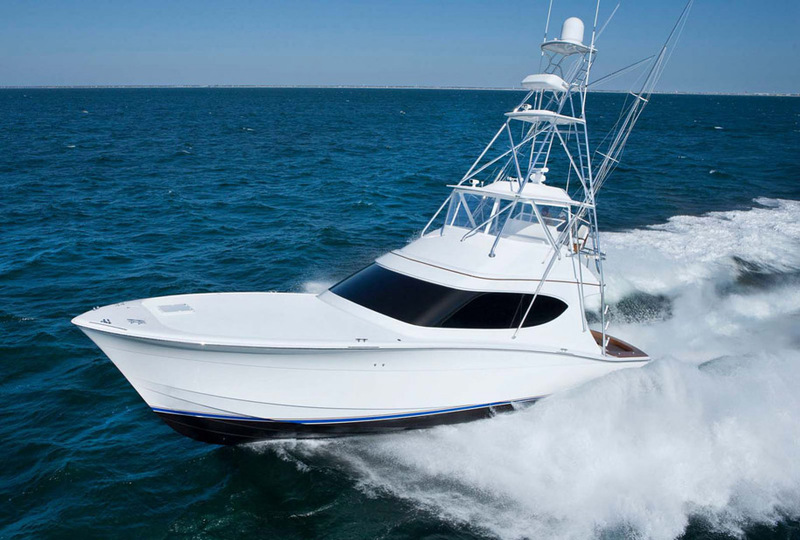 The Hatteras GT70 is truly a prime example of the legendary quality and performance that the Hatteras factory is known to produce. With speeds breaking the 40-knot threshold and every feature designed for the passionate angler, the new Hatteras GT59 is already making waves on the Billfish tournament circuit. Twin CAT C-32A 1600HP diesel engines are the standard power choice and with the patented Hatteras hull design and construction, she performs outstandingly well. Owners enjoy the popular 3-stateroom, 2-head layout that allows an owner to enjoy cruising with his family or taking the team offshore for several days to hunt big game. 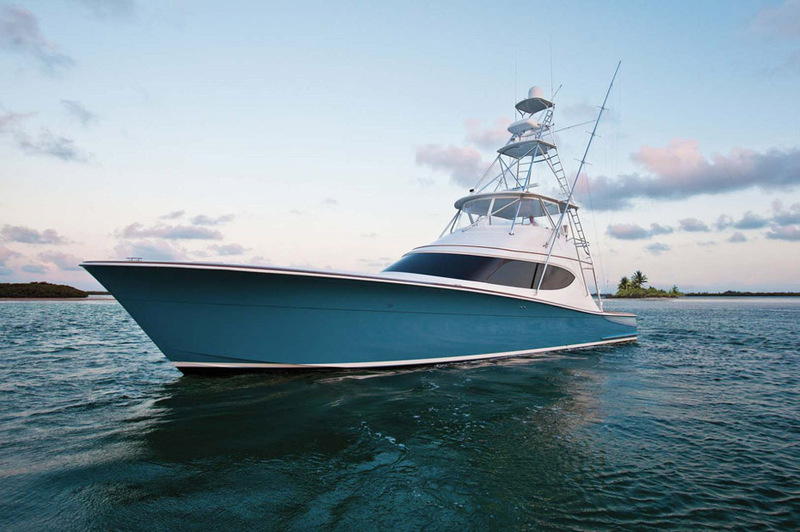 When Hatteras Yachts absorbed the iconic Cabo Yachts brand, it was only a matter of time before the models would begin to integrate the best of both brands into a new style of sportfish. Hatteras did not disappoint the market by launching three versions of its GT45X including an express cruiser, an express sportfish version with flybridge, and a Sport Tower option as well. All models come standard with the popular twin Cat C-12A Diesel engines and either a one or two stateroom layout. TheGT45x Flybridge version has top speeds in the mid-40’s and comes entirely rigged for any tournament featuring a state-of-the-art helm station with a full tower and plenty of easily accessible storage for tackle. You can even enjoy cooking your catch within minutes of it being in the water with the electric grill built in to the starboard bait and tackle center. If you’re looking for a durable sportfish in the Cape May area, there is no better option than a new Hatteras GT45x with the expert guidance of United Yacht Sales. The reception of the Cabo 41 Express has been more than welcoming after it made its debut at the recent Atlanta Boat Show and Miami International Boat Show. Anglers have been anticipating the return of the iconic Cabo brand for some time and several hulls of the 41 Express have already been sold. Standard power is twin Volvo D11 625HP engines and the fighting cockpit is loaded with fishing features like in-deck fish boxes and in-transom baitwell. 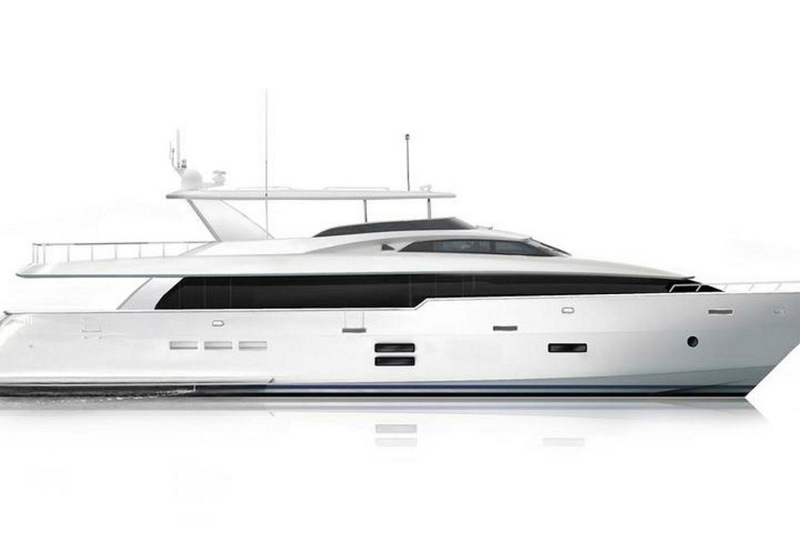 The Cabo 41 even has mezzanine seating for guests who want to watch the action unfold. What does Hatteras do differently with its hulls? If a trip to the Hatteras factory is in your plans, make sure to ask to see the log test. Hatteras loves to show off how strong their full fiberglass hulls are and have developed a way to simulate potential damage to the hull of a Hatteras should it hit a log at 20 knots. While Hatteras Yachts may be heavier than their competition, they are also stronger and more durable. The hulls are built using the highest quality fiberglass possible combined with vinylester resin which has optimal strength, stiffness, and impact resistant qualities. During the construction process, Hatteras also adds a coat of high-performance vinylester gelcoat to the entire hull that's below the waterline. This extra layer helps protect the hull against bottom blisters which is an extra step that many competitive boat builders simply don't take. Finally, the bottom of the hull gets an additional cost of epoxy resin as part of the anti-fouling system and for an added layer of protection. Does Hatteras "vacuum-bag" their hulls like other yacht manufacturers? The term vacuum-bagging is widely used in the marine industry with many builders vacuum-bagging the entire hull so it can be infused with varying qualities of resin. At Hatteras, there is a proprietary vinylester resin infusion technology that literally pulls the resin through the fiberglass instead of saturating it. The result is a hull that is lighter and stronger than if it had been fully bagged and infused. Bob Arthur has been on the Hatteras team for over 40 years and has seen the entire evolution of the brand and all of its models.. His current title is Hatteras Manager of Structural and Composites Engineering. “We would rather do infusion and get the cleaner, clearer hull surface it produces than to use vacuum-bagging,” said Bob Arthur. “The infusion allows us to really dial in our resin-to-glass ratio for stiffness and strength. What a lot of people don’t know is that back in the ’80s, Hatteras actually helped to develop the very first vinylester gel coat for use in composite construction." It's team members like Bob who live and breathe the Hatteras product and their devotion to it, that makes it a very special boat. Hatteras has never been one to shy away from trying something new. The Hatteras GT65 Carolina will utilize a new hull and tunnel design. The team utilized a high-tech CFD Analysis (CFD stands for Computational Fluid Dynamics) to make sure they got the hull shape perfect for maneuverability and performance.  Additionally, Hatteras will infuse the stringer system to the hull to make one single, solid part. Not only will this reduce weight and increase the hull strength, but it will also be the first in the marine industry. What is the Hatteras System called Hatt/Con? Hatt/Con is what the Hatteras team is calling their new innovation in total ship management. Hatt/Con was instituted on Hatteras models to offer owners and captains an easier way to control the yacht's navigation and other operating systems on board right from an easy-to-read dashboard. The consolidation of all of these functions into the Hatt/Con system means that the helm station is no longer populated with multiple modules and inconsistent operating systems. Hatt/Con allows the captain to operate systems on board such as lighting in various rooms, stream video, HVAC temperature regulation, and control all of the ships systems. Gauges for fuel tanks, fresh water, and grey/black water holding tanks are also featured. The Hatt/Con dashboard and ship management system can be downloaded right to your iPhone or iPad as an "app". What kind of engines do Hatteras use in their yachts? While Hatteras models on the brokerage market can vary depending on how far back you go, today's Hatteras Yachts are outfitted with Caterpillar marine engines. "CAT Marine Engines really do set the standard when it comes to performance and engine reliability," said Scott White, United Hatteras Brand Manager. "Caterpillar continues to innovate their products and the customer support that owners get is just incredible." The Hatteras M90, for example, is equipped with twin CAT C-32A diesel engines. The C-32A are one of the most popular engine models that boat builders are using today. The M90 C-32A's are 1,622HP each pushing it to a top speed of 21 to 23 knots while cruising comfortably at 17 to 19 knots. The Hatteras M60 drops down to the C-18A 1,000HP engines, but owners can upgrade to the 1,136HP models. On the Sportfish side where speed is everything, Hatteras chose to put the C-32A 1,622HP diesels in the new GT59. With that much power in a sub-60 foot boat, the GT59 can reach speeds in excess of 40 knots. The C-32A is also used in the flagship model of the GT-series, the GT70, except in the 1800HP versions. GT70 owners can cruise easily in the mid-30 knot range and top out above 40 knots. What is the Hatteras boat called The Knit Wits? The Knits Wits has become a bit of an icon for Hatteras Yachts and represents the very first Hatteras boat ever built. The 41-foot white and teal flybridge was fully restored at the Hatteras factory back in 2013 and has done several tours at major boat shows and events. The Knit Wits was originally launched in 1960 by Hatteras founder Willis Slane who was frustrated by the rough sea conditions. Slane then went on to hire Jack Hargrave to design the sportfish. The success of The Knit Wits is often credited with shifting the industry from wood to fiberglass made boats as many boats at that time couldn't withstand the same conditions as the Knit Wits proved to do. The Knit Wits is now a piece of boating industry and Hatteras history as she spends her days in retirement on display at the Hatteras Yachts Sales Center in Fort Lauderdale. What is the biggest yacht Hatteras makes? 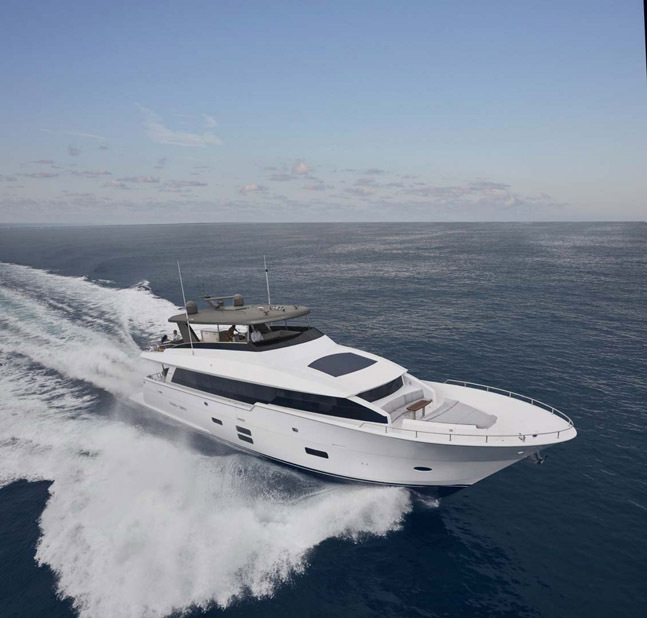 The Hatteras 105 Raised Pilothouse Motor Yacht is currently the largest yacht that is offered in the Hatteras model line. The design for the Hatteras 105RPH was launched in May 2018 and was lauded as the largest resin-infused hull to date. This news came after the Hatteras 100 Motor Yacht was launched back in 2014. Perfect for entertaining large groups of people, there is a large great room that is located on the main deck of the yacht that is reminiscent of a ballroom. Owners even have the option to choose two distinctive layouts including either a luxurious master stateroom on the main deck or a very large galley if the purpose of the vessel is more for entertaining than long-distance cruising. What's the best place to see a Hatteras Yacht? Boat Shows are undoubtedly the best venue to climb on board and compare any of the Hatteras models. The three biggest boat shows for Hatteras and Cabo are the Fort Lauderdale Boat Show in November, the Miami Yacht Show in February, and the Palm Beach International Boat Show in March. The Fort Lauderdale Boat Show is generally the largest of the three shows and where Hatteras brings their full line-up. Whether you are considering a motor yacht or a sportfish, Hatteras will have a mixture of both types of yachts at each of these boat shows. It is also a great opportunity to meet with factory representatives who can answer specific questions about each model. Engine manufacturers are also sometimes in attendance as well to answer engine-specific questions about performance and after-sale service. Can a new Hatteras Yacht be deducted as a business expense? While United Yacht Sales does not offer any financial or legal advice, there were changes to the tax laws that allow owners to deduct the full expense of their Hatteras Yacht. While there are several stipulations, the yacht you purchase must be used for a business such as yacht charter or fishing charters. Even new equipment such as electronics can be fully deducted as long as they are added to the yacht in the same year as it was purchased. This new law covers the purchase of both new and used yachts for sale. We recommend that you consult with your certified accountant or lawyer regarding the new tax laws and if your Hatteras or Cabo Yacht purchase could indeed be written off.